In February, the Order of Malta volunteer group returned to Acadiana to continue assisting in the flood recovery effort. This time they went to St. Martinville, LA. Ms. Mary, 74 years old, flooded in August 2016. Her house was partially gutted in the summer of 2017 during the large Eight Days of Hope effort, after that repairs to her home stalled. She had been living with the exposed concrete sub-flooring for nearly two years. The Order of Malta team finished gutting her home and made substantial repairs to get Ms. Mary’s home back to normal. Although Order of Malta accomplished an amazing amount in their week long trip there was still a huge job ahead of Ms. Mary. She had accumulated a lot over the years and eventually just got to the point where she was unable to go through it alone. Fortunately, for our March ‘Second Saturday’ project we teamed up with the ULL AmeriCorps members for an all team day to help Ms. Mary go through and get rid of all the unnecessary items she no longer wanted. Ms. Mary loved the attention and conversations she had with all of the students, too. After a long and productive day, she was finally able to relax in her home. Rebuilding Together Acadiana teamed up with Sears to provide critical home repairs to U.S. Army veteran, Mr. Henry, and his wife in Crowley, LA as a part of the Sears Heroes At Home Program. It is a national program designed to assist low-income veterans in the community and their families. Since the inception of the program in 2007, over 1,700 projects and nearly 42,000 volunteers have donated 333,000 hours to support veterans and their families through critical home repairs. Mr. Henry and Mrs. Laura are native to the Acadiana area and the city of Crowley. They have lived in their home for almost thirty years now, and raised their three children there. Although Mrs. Laura is fourteen years younger than her husband, she likes to say that it is he who has the better memory of the two. They are a military family with two of their children also having served or currently serving. Mr. Henry is a cancer survivor and a proud homeowner. He has watched his community change over the years, but he has always been able to maintain his home on his own. His wife, Laura, also suffers from Lupus and issues related to high blood pressure. She has a pacemaker and a heart monitor that must stay plugged in at all times. The old carpeting in their house has negatively impacted their health, and after having their house lifted cracks developed in the walls and tile floors, creating a trip hazard. Over the years, Mr. Henry’s back has not been what it used to be and things are harder for him to maintain alone. Rebuilding Together Acadiana was able to tear out all the old carpeting that went throughout the house and replace it with a vinyl plank flooring that will not trap dust and other allergens. We repaired a hole in their ceiling that was left after a leak in their roof had previously been repaired. Throughout the process, Mr. Henry worked alongside volunteers, getting rid of clutter around the house where he could. Our youth volunteer team out of Georgia really enjoyed spending time with the couple, even writing them a letter on the last day containing everyone’s signature. Thanks to Sears Heroes at Home, we were able to serve this veteran and his family and provide a safer and healthier home. 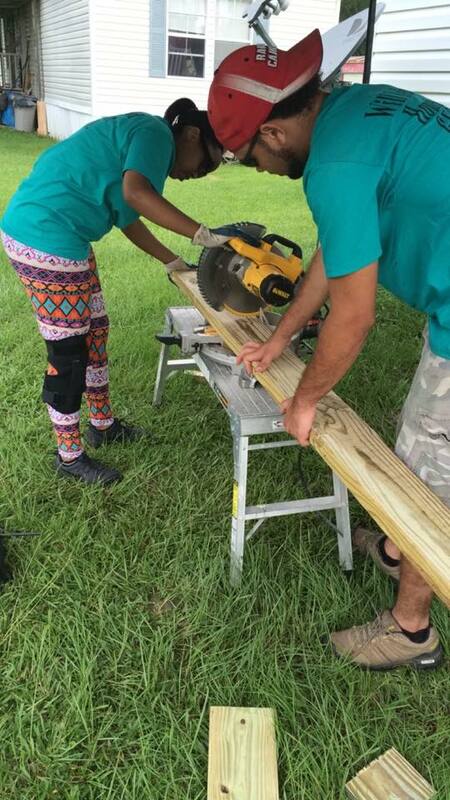 Life Teen Restore 2018 kicked off this July, making critical repairs to homes across Acadiana. Over 50 volunteers painted, floored, and trenched their hearts out. 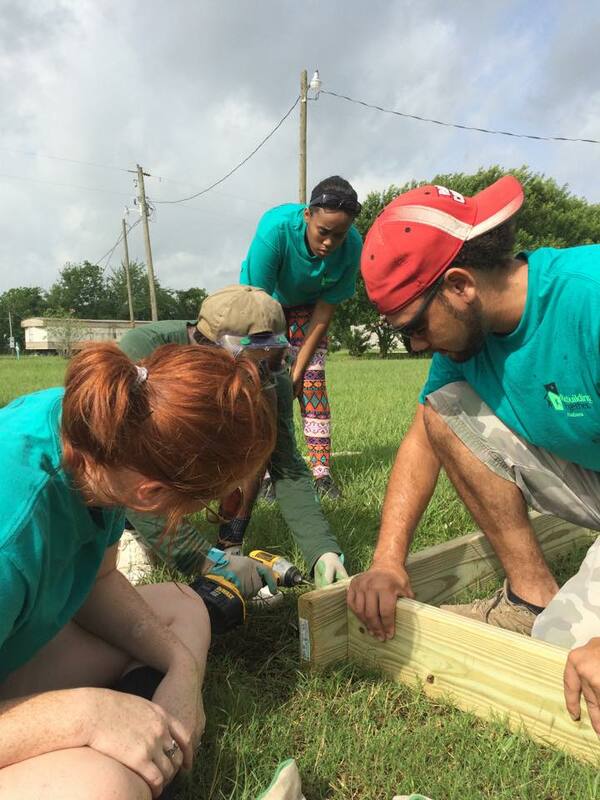 They spent four days working in some of the hottest weather South Louisiana has to offer, but by the end of it they left feeling impressed and proud of what they had accomplished. 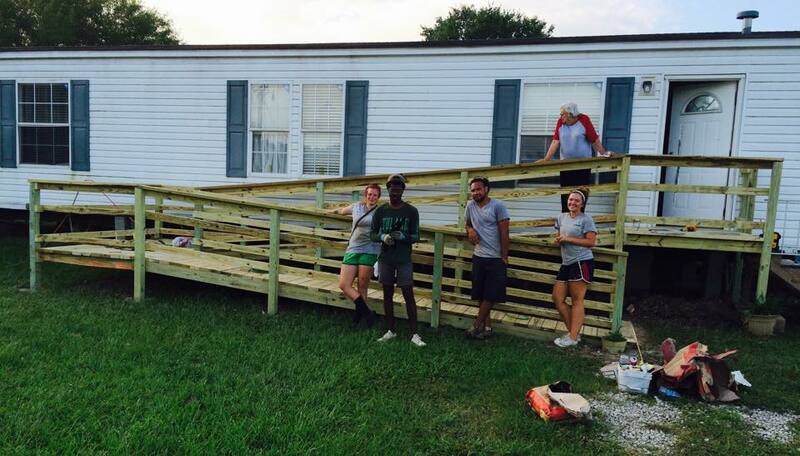 The groups built two handicap accessible ramps, laid flooring, and painted the exterior of houses all in record time. Rebuilding Together Acadiana was proud to host such a great group, and we look forward to seeing them again in the future! 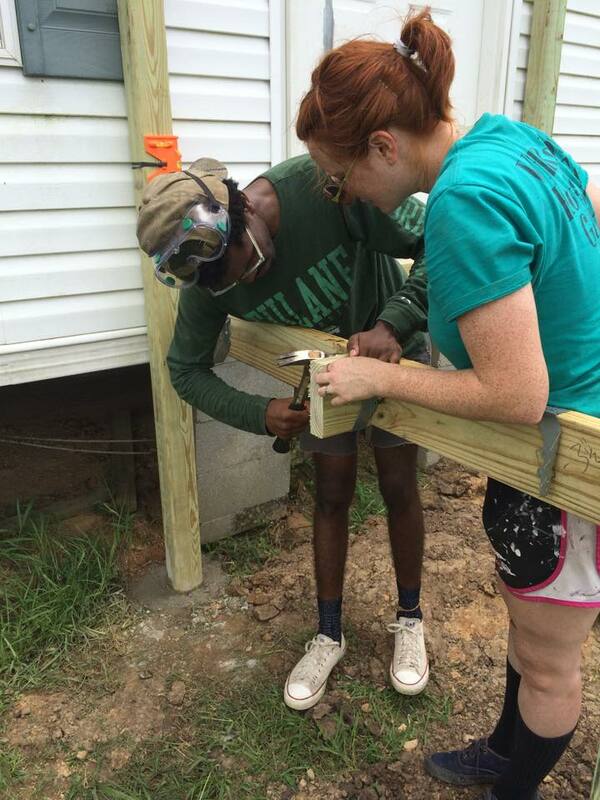 This month, Rebuilding Together Acadiana had the opportunity to construct a wheelchair ramp for a little boy, named Joey, who was born under difficult circumstances. His mother, Christina, is a nurse in Lafayette, and she met Joey one night while working. She was taking care of him in the NICU, when his biological mother came in to visit. She wanted to turn off Joey’s ventilator and let him go. Christina was heartbroken at the idea, and she and her husband ended up getting their foster parent certification. After spending 125 days in NICU, that sweet little boy went home with them. Fast forward a bit and they are officially his parents. Joey is now almost 2.5 years old but unable to crawl or walk. James, his father, takes care of Joey most days, but both parents work. Joey has several health issues due to bleeding in his brain. Among his diagnoses is cerebral palsy. He receives regular shots of Botox in his legs and physical therapy in an attempt to loosen his muscles, but for now he must use a wheelchair in order to get around and in order to get to his numerous doctor visits. James and Christina have ordered Joey his wheelchair, and now they have a completed ramp. Our AmeriCorps members and volunteers were touched to be able to construct this for Joey and with the help of his father, James. Getting him in and out of the home will now be much easier and safer. It has been a month since record rainfall tragically flooded our state and people are still struggling to recover. The flood waters have receded and Rebuilding Together Acadiana is currently helping in the clean-up process. In partnership with AmeriCorps members through University of Louisiana Lafayette, NCCC and ADRT and collaborations with other organizations like Lafayette Habitat for Humanity, we have been serving throughout the community to help those whose homes are still being threatened by the after effects of the historic flooding here in Acadiana. The relief effort is ongoing and Rebuilding Together Acadiana is proud to lead in that effort. We are preparing for the transition to home rebuilding and are looking forwards to helping families return to their homes and lives! Summer 2016 brings us our new SummerCorps members, Ryant Johnson and Elizabeth Louviere! Ryant is working on his bachelor’s degree in Visual Arts with a concentration in Photography from the University of Louisiana at Lafayette. He is also a member of UL Lafayette AmeriCorps. Elizabeth is working on her master’s in Criminal Justice from the University of Louisiana at Lafayette. She is a former member of UL Lafayette AmeriCorps. For this dynamic duo, a summer without servicing their community was not an option! We must also say a bittersweet farewell to our departing Capacity Corps members, Karleigh Presutti and Grace Long. Karleigh is heading back home to New York while Grace is headed to their next adventure in Australia! 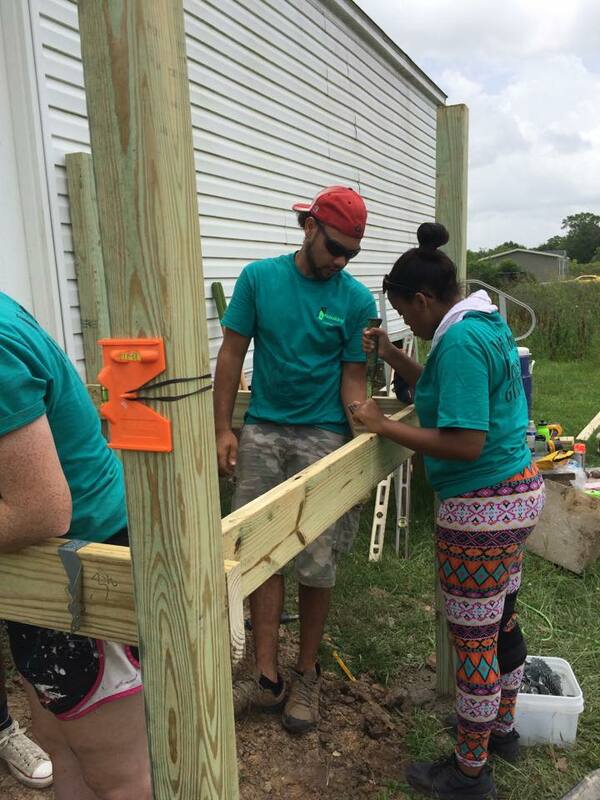 During their service year they worked on over eleven homes in Acadiana. We are sad to see them go, but we are excited to see where their love of service will lead them next! Rebuilding Together has acquired some new members! Introducing our new SummerCorps members, Nick Jeffery and Jonta Vedol. We are very excited to see what they can contribute to the Rebuilding Together team. Nick is currently enrolled at University of Louisiana at Lafayette and is also part of UL’s AmeriCorps program. Jonta is from New Orleans and is completing his undergrad at Tulane University. We also want to introduce our intern, Kiana Cornish. Kiana is going to be a senior at Acadiana high school this fall and is part of Future Business Leaders of America. She plans to further her education at University of Louisiana studying accounting and nursing. And last but not least, we would like to send a big farewell to our CapacityCorps members Caroline Beachy and Karleigh Presutti. Caroline will be headed back to Columbus, Ohio where she will be serving a second term with Rebuilding Together Central Ohio. We are going to miss her! 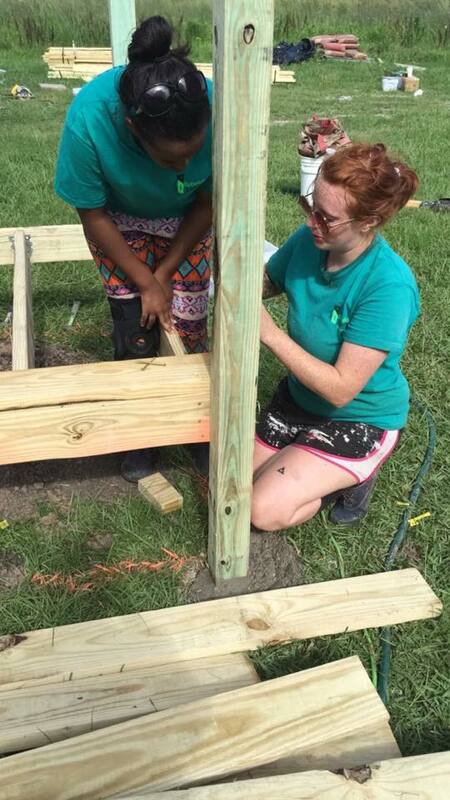 Karleigh plans on going back to Angelica, New York for the summer and will return to serve a second term with Rebuilding Together Acadiana. We are excited to have her come back in August. Caroline and Karleigh have been such a great part of the team, we wish them both the best of luck with their second terms!